Прокуратура не нашла в действиях умершего в следственном изоляторе директора московской школы № 1308 Андрея Кудоярова, обвинявшегося в вымогательстве, состава преступления. Декларации кандидатов «Единой России» показали, что партия власти — это партия богатых. А высшие чиновники демонстрируют чудеса экономии: при небольших доходах они имеют хорошие накопления и обеспечены недвижимостью. Gadhafi capture means big win for U.S.
CNN's Barbara Starr reports the possibility of Moammar Gadhafi's capture is a national security plus for the U.S.
A still image taken from amateur video posted on a social media website and obtained by Reuters shows former Libyan leader Muammar Gaddafi, covered in blood and held by NTC fighters in Sirte. GENEVA (Reuters) - The United Nations and human rights groups called on Friday for a full investigation into the death of Libyan leader Muammar Gaddafi and voiced concerns that he may have been executed, a war crime under international law. Images filmed on mobile phones before and after Gaddafi's death showed him wounded and bloodied but clearly alive after his capture in his hometown of Sirte on Thursday, and then dead amidst a jostling crowd of anti-Gaddafi fighters. "If you take these two videos together, they are rather disturbing because you see someone who has been captured alive and then you see the same person dead," U.N. human rights spokesman Rupert Colville told Reuters Television. Asked whether Gaddafi may have been executed, he said: "It has to be one possibility when you look at these two videos. So that's something that an investigation needs to look into." Under the Geneva Conventions which lay down the rules of conduct in armed conflict, it is prohibited to torture, humiliate or murder detainees. The International Committee of the Red Cross (ICRC), which upholds respect for the 1949 pacts, said it had no information on Gaddafi's death. "In general, a captured person must be treated correctly," an ICRC spokesman said. Russia believes that Gaddafi should have been treated as a prisoner of war according to the Geneva Conventions and should not have been killed, Foreign Minister Sergei Lavrov said on Friday, calling for an investigation. "If Colonel Gaddafi was killed after his capture, it would constitute a war crime and those responsible should be brought to justice," Claudio Cordone, senior director at Amnesty International, said in a statement. Peter Bouckaert of Human Rights Watch, interviewed by CNN in Sirte near the drainage ditch where Gaddafi was captured, said: "We do not think he was caught in crossfire. Did Muammar Gaddafi die from wounds or did he receive a fatal head wound after he left this area? "We are calling for an autopsy and an investigation. This is a blemish on the new Libya that he died under suspicious circumstances," he said. Some 95 bodies were found after Libyan transitional forces took Gaddafi's besieged hometown, including several bodies executed with gunshots to the head, according to Bouckaert. 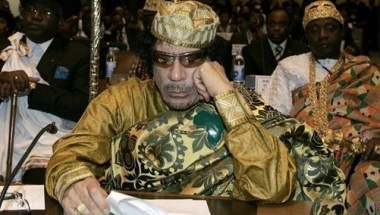 Gaddafi's body lay in an old meat store on Friday as arguments swirled over his burial and the circumstances of his death. With a bullet wound visible through the familiar curly hair, the corpse shown to Reuters in Misrata bore other marks of the violent end to a violent life that was being broadcast to the world in snatches of grainy, gory cellphone video. A television station based in Syria that supported Gaddafi said on Friday that the slain Libyan leader's wife had asked for a U.N. investigation into his death. Colville said it was a fundamental principle of international law that people accused of serious crimes should be tried if possible. The International Criminal Court (ICC) issued arrest warrants in June for Gaddafi, his son Saif al-Islam and their intelligence chief for crimes against humanity. "Summary executions are strictly illegal under any circumstances. It's different if someone is killed in combat. There was a civil war taking place in Libya. So if the person died as part of combat, that is a different issue and that is normally acceptable under the circumstances," he told Reuters. "But if something else has happened, if someone is captured and then deliberately killed, then that is a very serious matter," he said. Libya's interim Prime Minister Mahmoud Jibril said Gaddafi was killed in a "crossfire" while being brought to hospital after his capture. A doctor who examined Gaddafi's body said he had been fatally wounded by a bullet in his intestines. But a senior interim ruling National Transitional Council source told Reuters Gaddafi was killed by his captors: "While he was being taken away, they beat him and then they killed him," the source said. "He might have been resisting." U.S. President Barack Obama announces the withdrawal of U.S. troops from Iraq in the briefing room of the White House in Washington on October 21. President Barack Obama has announced that he will withdraw all U.S. forces from Iraq by the end of the year. "Today I can report that, as promised, the rest of our troops in Iraq will come home by the end of the year," Obama said from the White House. "After nearly nine years, America's war in Iraq will be over." Obama added that after January 1, America and Iraq will have "a normal relationship between sovereign nations, an equal partnership based on mutual interest and mutual respect." Obama made the announcement after holding a secure video conference with Iraqi Prime Minister Nuri al-Maliki. Talks on prolonging the U.S. troops' stay appear to have faltered over the question of legal immunity for U.S. troops. The 39,000 remaining U.S. troops in Iraq must withdraw by the end of the year under a bilateral security accord, which remains in force as no post-2011 was agreed. U.S. commanders had reportedly hoped to keep a small contingent of troops in Iraq after 2011 to help train Baghdad's forces, bolster the country's fledgling air and naval defenses as well as counter the influence of neighboring Iran.